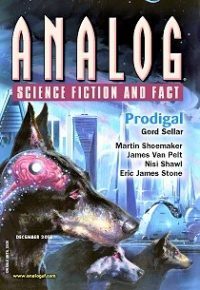 Stories this issue by Gord Sellar, Nisi Shawl, Robert Scherrer, Brendan DuBois, Eliot Fintushel, James C. Glass, Arlan Andrews Sr., Eric James Stone, James Van Pelt, and Martin L. Shoemaker. Reviewed by Chuck Rothman on TangentOnline here. Rich Horton comments on the Sellar, Van Pelt, and Shoemaker stories on LocusOnline here.